It takes visiting large production regions such as Rioja or Napa where they tout a wine as “small production” at 5,000 bottles to really appreciate the all-too typical story in both DOQ Priorat & DO Montsant where “small production” means a measly couple of hundred bottles. Such is the case with Mans de Samsó by Vinyes d’en Gabriel. This wine is made from an old, 115 year-old vineyard in the village of Darmós, which is in this small section of DO Montsant that sits just outside Priorat and in the neighboring county of Ribera d’Ebre. My understanding of the story, as told to me by winemaker Josep Maria Anguera is that this old, barely-producing vineyard of Carignan was one that his family wanted to rip out. The cooperatives used to make no distinction between old and young grapes years ago and paid the same. Given that doing the same amount of backbreaking work on new vines will net 1-2kg whereas this one would be 300g, you can see the economic reasons why they’d want to replant. Josep Maria insisted on hanging on to it and starting to work it. The wine that he now makes from it usually yields about 600-800 bottles a year and that’s it. 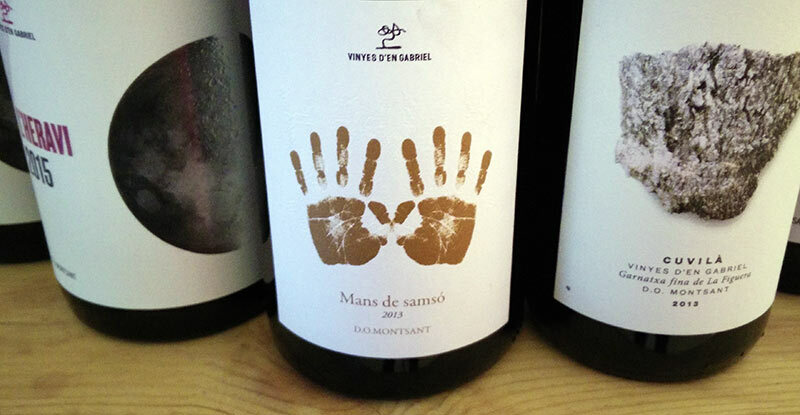 The label is an imprint of his grandfather’s hands (although it appears to me to be the same hand, mirrored) as a tribute to the work the man had done during his life thus the Catalan name, “mans de samsó” or “hands of Carignan.” Josep Maria is hoping to continue in to the future as the family apparently lays claim to a winemaking history in the village that dates back some 300 years. It is indeed a wonderful wine that he finds in this vineyard and while a great deal more potent given the hotter climate of Darmós than say nearby El Masroig, it is still very much old-vine Carignan that has a singular nature in the vineyards of this region. Incredibly dark ruby in the glass, nearly inky in color with essentially no rim variation. Floral and bold in the nose, it is awash in dense, dark fruits, mature plums, and a hearty underpinning of allspice. Broad and massive on the palate with a medium plus body and medium acidity, it doesn’t hold the longest of finishes which, despite the excellent quality of the wine would position it as one to drink in the next three years. Lovely to read the story of the family linked to this fascinating variety. A wine to be appreciated as I guess these old vines will not go on forever. Is new Carignan being planted? Oh yes, most definitely. There are new vines being planted all the time although Grenache tends to dominate. No idea. Josep Maria is often changing importers and distributors so it’s impossible to know who it could be currently. Also, very small production so it doesn’t often get seen outside of Spain.